Russia's outward and aggressive international posturing in Eastern Europe and the Caucasus may be calming a bit... at least for a bit. A two-bomb terrorist attack hit Moscow's subways a week ago, killing over 30, and injuring well over a hundred more. The attack was sophisticated in its timing and its execution, catching Russian security services completely off-guard; they could only clean up after the disaster. Other attacks hit Dagestan, a restive region in Russia where a large chunk of the population wants independence. Before I continue, I will say that I'm not 100% sure of the culprits--many signs point to separatists in the Caucasus, but a few rumors and reports indicate that Russian intelligence services may have been involved. A human rights lawyer/writer claimed that, after the attack, a man stepped out of the shadows, yelled, "you're supposed to be dead!" and hit her upon the head, before fleeing. That said, this may simply be a furious opposition writer taking an opportunity to blame the state for human rights abuses. Anyway, I digress. 1) Why now, in particular? 2) Did they have outside help? The first question may be an exercise left to the reader(perhaps you've read some news I haven't). The separatist regions are intermittently active, but their actions usually prompt a relatively brutal Russian response--in this case, Medvedev has said that Russian authorities need to show "more cruelty" in the Russian Caucasus regions in order to root out and break these terrorists. The Russian response is furious and, indeed, it is uniting the Russian people behind the state (in a time when popular opinion was starting to go against Putin and Medvedev). These attacks are unlikely to seriously further any bid for independence, but many militant groups are often prone to high-risk operations in hopes of creating a "quagmire"-style situation that ultimately weakens the central state's control over the area (even if there is not a formal relinquishing). Russia had left much of its separatist republics alone for some time in the 1990s, but it must be obvious to the Caucasus separatists that this is not the Russia of the 1990s. I therefore see dubious benefit to the separatists coming from this attack. The second question runs the risk of turning us into 9/11-style conspiracy theorists. At the end of the day, militants might not need much in the way of help to make these well-timed attacks. Months of planning, combined with easily-accessed arms and bomb-making materials from a number of central Asian former Soviet states, further coupled with a rather profound lack of communications infrastructure (great for internal spying and policing) would give them the time and freedom they potentially needed to pull the attack off. That said, it would not be at all shocking if they got help. If they did get help, the question is, from whom did they get help? Do Russian security services have an interest (especially in the light of declining popularity for United Russia) to try to boost poll numbers, unite the populous, or potentially win themselves more internal security powers? Do outside powers (like the CIA, the Georgians, or some sort of threatened Eastern Europeans) have an interest in forcing Russia's eyes inwards, in order to free up "space" to perform their own moves close to the Russian periphery? Both ideas seem dubious, but not completely out of the question. That said, how will Russia react? Is Russia's response to domestic terror going to be an insular one, where public opinion and Kremlin leadership alike decide to put a delay on expanding the sphere of influence? Or is the rise in unity and state popularity (which is almost inevitable, frankly) going to give the Putin/Medvedev duo a freer hand with which to rattle sabres near Russia's periphery? Ultimately, it depends on how quickly the Russians are to "get over" the tragedy. If they recover quickly, a legacy of higher polling numbers and "unity" will allow the Kremlin to get gutsy. If the pain should last, an outward stance would appear to be an ignoring of the real problems in Russia's periphery, and create a sense of the Kremlin being "out of touch" with the common Russian. Sadly, I don't think I have an answer on this one. A sudden warming of relations from Russia is stirring me a bit. 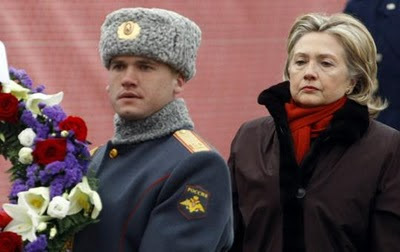 As Secretary of State Clinton visited Russia, Putin hinted that "Smart" sanctions against Iran are likely to gain support from Russia--this is a sudden turnaround from the Russian position over the last few years. Putin further agreed with Clinton that an arms reduction treaty was in the works for early April. My impression of the treaty is that it's unlikely to change the geopolitical landscape, but nonetheless, it's a symbolic gesture of cooperation. But Russia hasn't announced any plans to halt construction of a nuclear power plant in Iran, it isn't supporting US operations in Afghanistan, and it isn't backing off power plays in Estonia and Georgia. It begs the question--is there serious cooperation occurring, or is Putin simply trying to put the US off-guard (or at least reduce its political mandate to act against Russian plans?). Ultimately, the Russians do not particularly wish the Iranians or Taliban well, but as long as they continue to be a thorn in America's side, Uncle Sam can do precious little to counter Russian expansion into former Soviet territory. Can Iraq be a functional Democracy? This question rests on the minds of every foreign policymaker in the United States. So far, so good. Minimal violence marred the election, and over 60% of Iraqis turned out (this is about as good as most Western democracies). But the big test is still coming. The race is tight. US-picked Nouri al-Maliki is in a tight race with Sunni rival Allawi--and might just lose. But either way, neither is likely to get a majority in his alliance right away, which means that a long period of coalition-building awaits the budding Iraqi parliament. Such political grinds are typical of most parliamentary systems, but the question will be whether Iraq can handle it. If I had to guess, I'd guess that Iraq's democracy is unlikely to collapse or even suffer a major crisis. No matter who wins, getting ethnic/religious/political minorities in their coalition will, to some extent, be necessary. Sunnis and Shiites alike will be represented in the ruling coalition of the government--the question is really only "how much?" And frankly, the Sunnis should be used to being a minority representative (but if they are a key player in the coalition, then they have virtual veto power), and the Shiites are unlikely to begin slaughtering Sunnis or Kurds if they cannot hold an election despite a 60% majority--most reports are that losing parties are likely to sit back and reconsider their election strategies. In fact, a tough and indecisive election while US troops still remain may be an excellent low-pressure opportunity for the Iraqi political system to learn how to deal with gridlock, with toss-up. For it will, indeed, come again, and next time, nobody will be there to help sort out the cards. But if it should succeed, then the day may be won for the United States in a more significant way than anyone imagined since the naive days of 2003. The embarrassingly premature "Mission Accomplished" banner might possibly be unfurled, correctly this time, 7 years after its original debut. With a fair amount of ambivalent results and reporting about the US military's effectiveness, an opportunity to push its rapid-response and logistical expertise to the limits was just what it needed. And succeed it did. Despite major hangups at the Port-au-Prince airport and seaport, the US military successfully acted as the largest relief and charity organization in the country (and primary logistical/structural enabler for most of the other organizations there), and averted uncountable deaths during the disaster. Ultimately, the military's story is a story best told by those who were there. I recommend an article by Popular Mechanics written by a photographer/reporter in the thick of Haiti at the time. Why's perception so important? If the US military can show it is in top rapid-response readiness and can muster highly effective logistical wizardry at a moment's notice, then it implicitly delivers the message that, despite the resource drain of Afghanistan and Iraq, despite alleged distractions, the US military still has the capability to organize and move huge amounts of equipment and manpower away from the US continent at a moment's notice--now is not the time to make a military move in the hopes that the US is too bogged down to respond. And ultimately, this display of power (if not force) acts as a deterrent to potentially disruptive smaller nations (like Venezuela) and, at the very least, causes bigger nations (like Russia or Iran) to think twice before considering a bold move.